Kerlix Gauze Bandage Rolls from HealthyKin.com are made of prewashed, fluff dried 100% woven gauze with unique crinkle-weave pattern for loft and bulk. Kerlix Rolls provide fast-wicking action, superior aeration, and excellent absorbency. Finished edges on the product reduce loose ends and lint. I ordered non sterile wraps. I use them over the top of AB pads. They work great for what they are intended. They are for a loose wrap, no compression. The only website I use for my son's medical supplies. Quality and price is great and shipping is fast. Thank you Healthykin. This is the same gauze roll the VA hospital rapped my foot with during a check up. 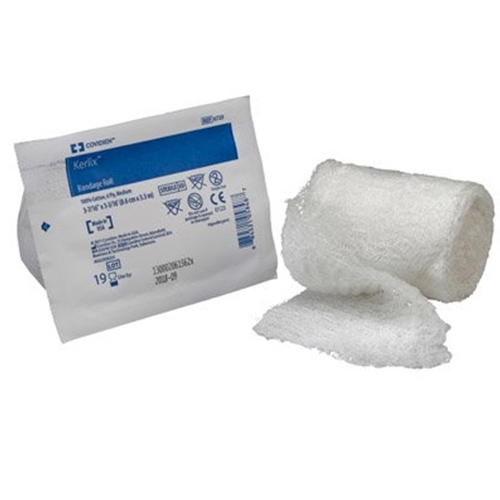 It was so far superior to the gauze rolls available at local drug stores that I searched, found, and ordered it here. The comfort advantage of this much thicker gauze for less cost than the much thinner drug store brand makes this choice a no-brainier. I very highly recommend this product. Note that the only difference between the steril and non-steril versions is that the less expensive non-steril rolls are not individually wrapped. This product works really well it gives me extra coverage protection along with the abdominal pad, I love it. Thinner than the ones I'm used to using.